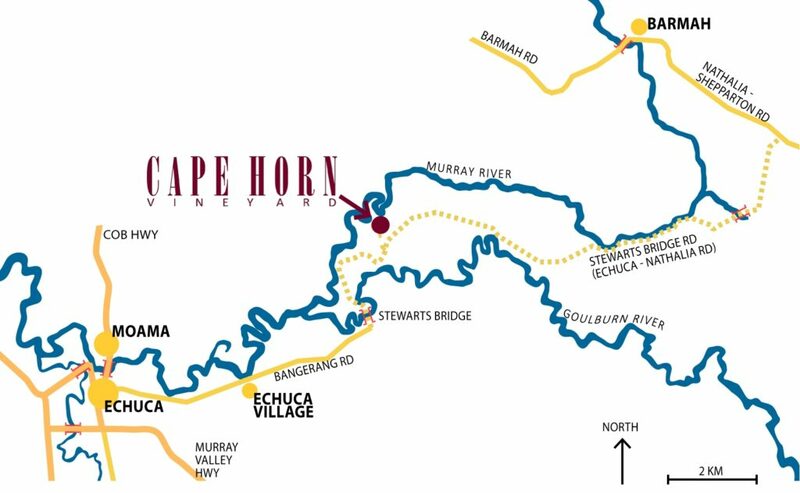 Located on the banks of the Murray River we’re just 15 min by car from Echuca, 30 min by speed boat and 4-5 hours by house boat. Why not come by horse & carriage, or fly! Cape Horn offers extensive lawn , picnic tables and a fully enclosed air conditioned/heated tasting room. From Echuca travel east along Bangerang Road and then take the turnoff North on the Echuca-Nathalia Road (east of McDonalds Rd intersection). You will cross the Goulburn River by using Stewarts Bridge, from this point the road is unsealed. From Melbourne travel North through Wallan, Kilmore, Heathcote, Elmore and Rochester.